Private and public clouds often use a single high-performance storage tier for most data. As enterprises and cloud service providers (CSPs) continue to experience dramatic data growth, this single-tier strategy will lead to rapidly increasing storage costs. Much of the growing volume of information is older, “colder” data ...that is infrequently accessed. There’s considerable potential to reduce cloud infrastructure costs by moving this data to a lower-cost storage tier specifically designed for infrequent access to cold data. To create cloud-based cold storage that effectively meets current and future requirements, it’s important to understand the usage models that are generating cold data, the challenges associated with each usage, and technologies that can help meet these challenges. Current usage models include backup, disaster recovery, archiving, and social media. Though each usage model has distinct characteristics, they all share requirements for adequate storage performance, availability, data integrity, and security. Additionally, compatibility with existing enterprise architecture is important for seamless access to data as well as to simplify manageability, which helps reduce total cost of ownership (TCO). 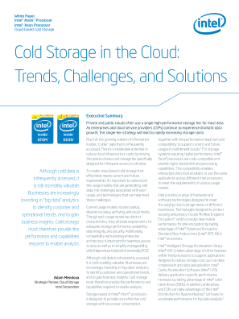 Read the full Cold Storage in the Cloud: Trends, Challenges, and Solutions White Paper.